Lead mining has been carried out in the area for a very long time, possibly back to roman times or before. Thus the most obvious mines, http://smhccg.org/geology/mines-of-stoney-middleton/like the tall Fingal’s Cave on the Gin, may be very old indeed, for they follow what would have been the most obvious veins exposed in the cliffs. Only later did miners drive long levels or sink deep shafts in their search for the richest deposits. As the miners sank their shafts to greater depths they encountered water. The solution was to drive a drainage level (a sough) from the lowest point in the valley to a point below the workings, lowering the water level in the limestone. The most important sough in the area, Moorwood Sough, discharges its water into the Stoke Brook immediately south of Stoney Middleton Church. It runs under The Nook to a shaft in the field below Mill Lane, then turns sharply to a shaft below the cliff at Rock Cottage, in the Dale. Another right angled bend takes it to Cliff Stile Mine, halfway between Stoney Middleton and Eyam, and it continues to Glebe Mine at Eyam, where it is 300ft below the surface. The sough collects water from a wide area, and has captured water that would otherwise flow from Carlswark Cavern. The journey to Glebe Mine up the sough involves wading in cold chest-deep water for long distances, but when it was driven it is likely to have been an easy walk. The sough was begun in the 1700s, and reached Cliff Stile Mine. There was a long pause here, but it was continued in 1830 to Glebe Mine. The sough followed mineral veins where possible, and the lead ore removed helped to finance the continued driving of the level. There are many small workings in the cliffs to the west of Rock Cottage (opposite Lovers Leap), but none is of great significance until we reach Cliff Stile Vein, between Keyhole Cave and Ivy Green Cave. There are no accessible extensive workings here now, but a branch discharges into Moorwood Sough at Cliff Stile Mine, and runs beneath this point. This is the Watergrove and Victory Level, and it was an ambitious project to drain the Watergrove Mine, two miles to the west, to a considerable depth. However the level hit hard volcanic rocks, referred to by the old miners as toadstone and it was abandoned. There are extensive workings in Cliff Stile Vein, accessible from the Victory Level. There was once a shaft into the level at the bottom of the cliff, but it has long been filled in and obliterated. The next working of any size is the large entrance known to the climbers as Fingal’s Cave, or Fingal’s Flue, possibly a very old working as the vein would have been readily visible to the earliest miners. There is another entrance close by at the base of the cliff, and a series of lower workings can be followed for some distance. Parts of this lower mine are very unstable, and waste rocks (deads) were piled on old timbers, many of which have rotted and gone leaving precarious jammed blocks in the roof. The top entrance to Carlswark Cavern itself is a mine, driven along Wonder Scrin. What we see now is the collapsed remains of the level that Dr Short used when he visited the cave, which he called Bamforth Hole. He entered a level a short distance to the west, and walked beneath the present entrance to reach the main cave. Tons of waste rock, no doubt held up on timbers, has now fallen into that level, and the collapse continued until it reached the surface to form the present entrance. The next accessible working lies high on the cliffs immediately east of Shining Cliff. The level soon intersects Shining Cliff Scrin, along which it turns and runs for just over 300ft to the north east. There are many mine workings in Eyam Dale, most extensive of which is the Merlin Mine. The entrance level crosses two small veins (scrins) and workings lead for some distance along both. Bits of natural cave are found here and there, and the mine was shown to visitors in the 1800s, though it must have been a rather severe show cave! The main Merlin Stream was reached by cavers at the lowest level in 1973. High on the sides of Eyam Dale there are a number of shafts on the vein of Sycamore Scrin. One of these was excavated in the 1970s, and connected with Carlswark Cavern, though the connection is now collapsed. Passing round the cliff between Eyam Dale and Cucklet Delf are more workings in Sycamore Scrin and Stub Scrin. The most extensive mine provides a through trip from a shaft near the top of the cliffs via a series of drops to emerge from a restricted entrance at road level. The Delf contains Delf Hole, high on the east side, a short mine working intersecting natural but silt-filled passages, but the most extensive mine is Nickergrove Mine. The name is interesting. When a miner made a claim on a lead vein, he was said to nick it. The main level of Nickergrove Mine follows a major joint in the limestone that runs at right angles to the veins, so that each successive small vein encountered could be nicked. A mine was also known as a grove or groove, so perhaps this was the Nicker Groove, the joint that was followed to nick the cross veins. 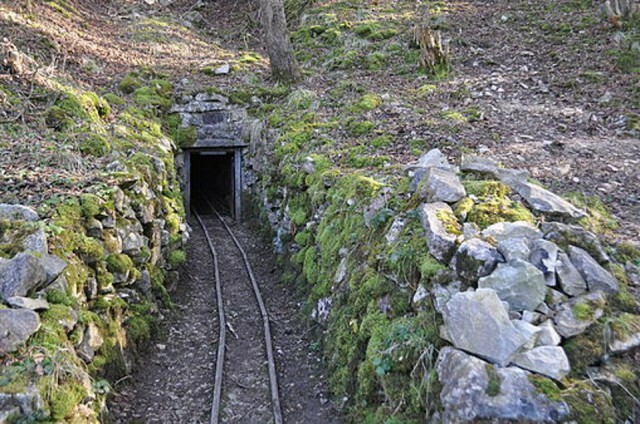 The main level runs for over 700ft to the north west, and a dig in the 1990s in the collapse at the end revealed more passage which ended just short of White Rake, the major vein worked in Glebe Mine, at Eyam. 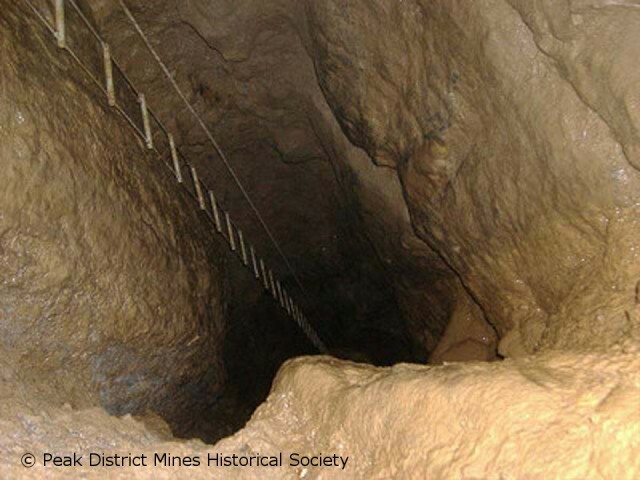 A shaft in the floor leads to lower workings and another entrance, and digging in a natural chamber revealed a way into the natural stream cave between Streaks Pot and the Merlin Mine. To the west of the Delf on Streaks Hillside are many small mines. The hillside is covered in little shafts many of which are covered, but some are open. The mines are all driven in small scrins, and are usually small and tortuous to explore. The upper entrance to Streaks Pot is a small mine level, which quickly breaks into the natural cave. Beyond the sharp bend on the A623 small veins continue to cross the valley from north east to south west, but there are no workings of any extent until Hanging Flat Mine is reached just beyond the entrance to Furness Quarry (named Horseshoe Quarry by the climbers, and now owned by the British Mountaineering Council). Until a few years ago there was a small building over the entrance, but this has gone and the entrance has collapsed so that a tight crawl must be negotiated to get in. The level was an old one, but was enlarged in the 1970s and 1980s to exploit Needham’s Rake, which runs parallel to the road on the north side. The main level is driven in solid limestone, with slits into the vein from which the ore could be drawn out. A right hand branch enters some very unstable older workings where large timber supports are slowly rotting away. The story of the mines of the Dale isn’t complete without mention of Watergrove Mine. This is evident by a group of shafts around Housley, where the road begins to descend towards Wardlow Mires. The water problems here were solved first by the driving of a sough which discharges by the sharp bend in the Dale. The sough enters the mine only 150ft down, and water was pumped up into it. An ingenious system of doors and valves allowed different parts of the mine to be isolated when the water was high so that the drier parts could be worked. The Fairburn Engine Shaft is a huge oval shaft roughly 10ft x 15ft, and when found in the late 1960s it was covered with a cone of gritstone blocks just below the surface, completely hidden under the level turf! The mine worked the deposits in large natural cavities which had been filled with sediment. The sediment was washed to extract the placer deposits of lead which had been left behind when the lighter material was washed away. Thanks for the information provided in Mines of Stoney Middleton. I am particularly interested in information on Cliff Stile Mine and associated veins. Clearly you have more information than I have been able to locate….for example the Victory Level and drainage into Moorwood Sough. 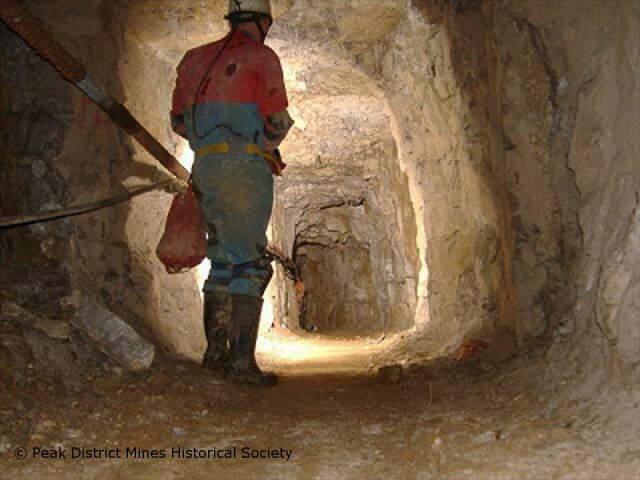 Are you aware of any physical access to Cliff Stile Mine via shafts etc?